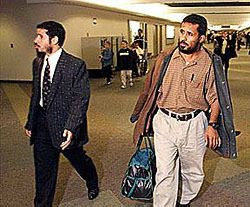 On the left, Ahmad Al-Akhras, one of Columbus Mayor Michael Coleman’s closest advisors; and on the right, Muhammad Al-Qudhaieen and Hamdan Al-Shalawi, the two Saudi Al-Qaeda terrorists Al-Akhras and CAIR-OH publicly defended and filed a lawsuit on behalf of that the 9/11 Commission found had conducted a pre-9/11 “dry-run” on a Columbus-bound America West flight in November 1999. The men are pictured walking through Port Columbus Airport. It wasn’t appropriate to mention yesterday since 9/11 is a day of honor and sober reflection, but it certainly bears worth mentioning the bit role that Central Ohio resident Ahmad Al-Akhras played in America’s infamous day of terror. On November 19, 1999, America West Flight #90 from Phoenix to Columbus landed at Port Columbus Airport and was greeted by FBI and local law enforcement officials. Two Saudi students — Muhammad Al-Qudhaieen and Hamdan Al-Shalawi — were handcuffed and immediately placed into custody. All passengers were evacuated from the flight and bomb-sniffing dogs were brought in to search the plane. Before the plane landed, the flight’s pilots had radioed ahead that Al-Qudhaieen and Al-Shalawi had repeatedly tried to enter the cockpit even after being warned by the flight crew not to attempt further entry, kept changing seats, as well as asking the flight crew strange questions about the plane and its destination. According to the 9/11 Commission Report (page 520, footnote 60), intelligence authorities are convinced that Al-Qudhaieen and Al-Shalawi were conducting a “dry-run” for the 9/11 attacks. Both men were friends of Arizona-based Al-Qaeda recruiter, Zakaria Mustapha Soubra, who drove them to the airport that day in Qadhaieen’s car. Both men attended the Islamic Center of Tuscon, which counterterrorism expert Rita Katz described in a Washington Post article in September 2002 as “basically the first cell of Al-Qaeda in the United States; that is where it all started”. Ahmad Al-Akhras, president of the Council on American-Islamic Relations, Ohio chapter, said that the government and the airline industry appear to be profiling Arabs and Muslims. “It’s called Islamophobia,” said Andy Amid, former president of Arab Americans of Central Ohio. Except in this case, the two men involved were terrorists, Al-Akhras and Amid’s protestations notwithstanding. 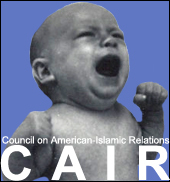 CAIR is pursuing legal action and asking Muslims, Arabs and other concerned people to boycott American West until it investigates the issue and makes corrective measures. CAIR is exploring all leagl [sic] venues at this time and may press charges. i’ll keep you posted. salam. What legal charges Al-Akhras and this CAIR crew had mind against the flight’s pilot he doesn’t say, but in fact, CAIR filed a lawsuit in 2000 against America West on behalf of the two Al-Qaeda terrorists over the matter, which the judge quickly dismissed. But the damage by Al-Akhras and his CAIR comrades had been done. Instead of beefing up airline security, CAIR’s intimidation tactics were no doubt instrumental in maintaining the status quo in aviation security, that is, until 9/11. Katherine Kersten of the Minneapolis Star Tribune reminds us that despite CAIR’s connection to the 9/11 dry-run, that incident has served as a prototype for CAIR’s response to aviation incidents ever since, such as the “Flying Imams” case last November. Curiously, CAIR has scrubbed any mention of the incident and their participation in it from their website. As the 9/11 Commission Report explains, Hamdan al-Shalawi was in Afghanistan in November 2000 training at an Al-Qaeda camp learning to make car bombs and planning to launch “Khobar Tower”-type attacks against the US in Saudi Arabia, and Mohammad Al-Qadhaieen was arrested in June 2003 as a material witness in the 9/11 attacks. Not suprisingly, Ahmad Al-Akhras and Andy Amid have never apologized nor expressed any remorse for their contributions to America’s day of terror. While the two Saudi terrorists were later discovered to be an integral part of Al-Qaeda’s pre-9/11 network in the US, Al-Akhras and Amid’s intimidation campaign against law enforcement and airline security accomplished exactly what Al-Qaeda wanted it to. The result was 9/11 and the death of 2,996 innocent civilians. Oh, did I forget to mention that Ahmad Al-Akhras is one of Columbus Mayor Michael Coleman’s closest advisors?